Keep your products safe and looking new from factory to sales floor to the moment the buyer unpacks their purchase. 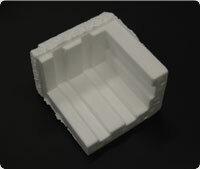 With a wide range of sizes, shapes and thicknesses always in stock, there's an option that's right for your needs. 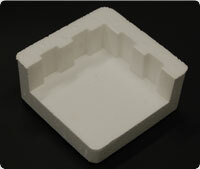 Most of our pads and protectors are molded with dependable, lightweight expanded polystyrene (EPS). 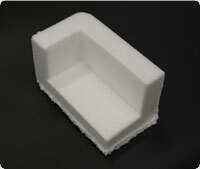 And for products that need heavy-duty protection, we offer rugged E-Por foam for added durability. 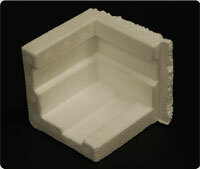 All products can be made in E-Por®, EPS® or NeoPor®. Inside bearing area 18.56 sq. in. OD: 3.5" x 3.5" x 2.75"
Inside bearing area 30.81 sq. in. OD: 5.125" x 5.125" x 2.5"
Inside bearing area 38.5 sq. in. OD: 4.125" x 4.125" x 7"
Inside bearing area 24 sq. in. OD: 3.5" x 3.5" x 3.75"
Inside bearing area 36.67 sq. in. 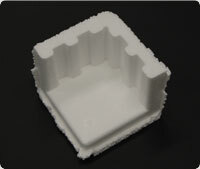 OD: 3.625"x 4.875" x 5"